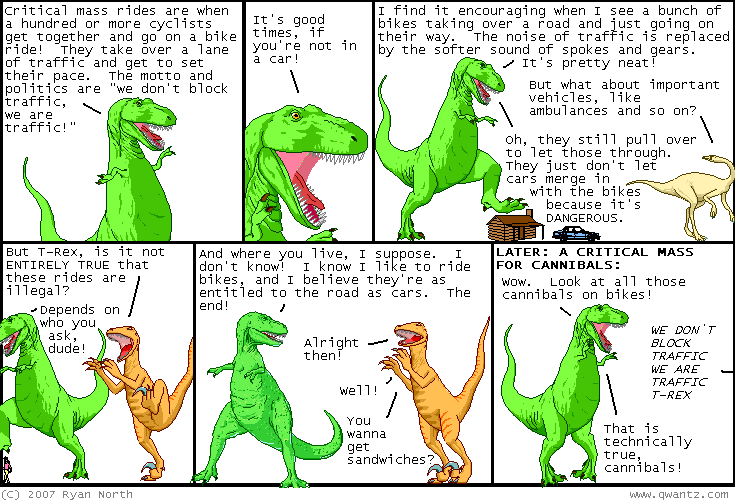 Dinosaur Comics - January 25th, 2007 - awesome fun times! January 25th, 2007: Here are some new comics I've come across lately that I think you'll like! First is The Pleasure Is Back, which are clippings from magazines (text and pictures) arranged together by Adam Medley. Most would make excellent posters to hang above your bed. Next up is Felt Up which I discovered through Project Wonderful, and here you will find short stories illustrated by pictures made in felt. Sometimes there aren't stories. It's pretty rad! The last is Captain Excelsior, which is BRAND NEW, and combines the writing of Zach "SMBC" Weiner and Chris Grumps Jones. It is promising and also very pretty. Enjoy! oh also I almost forgot! There's an interview with me and Nick and Rob DenBleyker up at A Modest Proposal. We all come across as pretty okay! One year ago today: "dinosaur comics: it's online!"